If you are new to watercolors, this list of supplies can seem overwhelming. I suggest bringing whatever supplies you have on hand to our first class in addition to a few watercolor "round" brushes and the supplies on this list that I've marked with an *. Shopping for art supplies and books is one of the best things about being an artist but it can also be overwhelming if you haven't figured out your favorites yet. Below is a list of watercolor supplies that I love and recommend. These are recommendations for paintings, not for sketching. If you are looking for sketching supplies, please scroll down to the heading "Sketchbook Supplies for Adults." You can click on any item listed to go to a link on Amazon.com. I like palettes with plenty of deep wells for my paints. I have a ceramic palette at home. It's nice and heavy and a joy to paint with. But I also have several plastic palettes. They are easier for transportation and less expensive. There are many choices out there and these are just two suggestions. There are hundreds of colors to choose from and you'll have an adventure experimenting with the perfect palette to match your expression. To get started all you really need is a good red, yellow and blue. I've listed my favorite starter palette colors below. These include a cool, a warm and a neutral for red, for yellow and for blue. Below these favorite 9 colors, I have listed some of my favorite colors. Pick up as many or as few as you like. My favorite brands are Daniel Smith and Winsor & Newton. 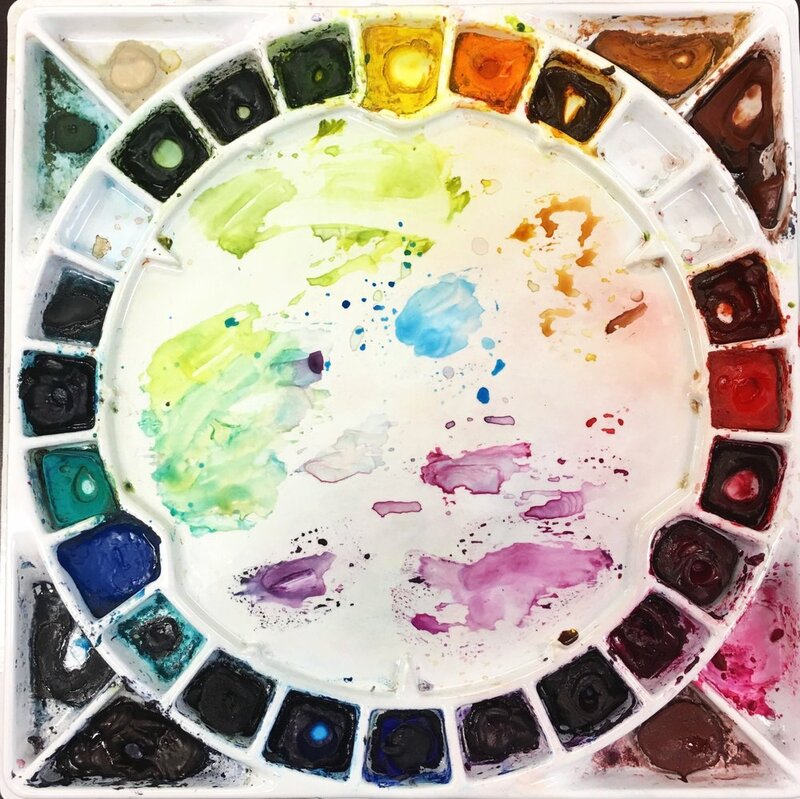 I use both tube paint and pan paint but I recommend tube paint for my general watercolor courses since the wells are bigger and allows for more mixing and larger experimentation. Since paint colors by different manufacturers can be quite different from one another even if the names of the colors are the same, this list of colors link to the color in the specific brand I prefer for each color. These favorites of mine are linked to Amazon. Keep in mind that colors are a personal choice. Look around for what appeals to you! Besides Daniel Smith, other artist quality brands include: M. Graham Watercolor, Winsor & Newton Professional Watercolor, Sennelier Extra-Fine Watercolor and Schmincke. There are brushes for watercolors, for oils, for acrylics, for pastels, etc.... Be sure you buy brushes that are for watercolors. There are natural fiber brushes, synthetic brushes, and brushes that are a mix of natural and synthetic fibers. And the price can vary between $2 and $200 plus! Then there are shapes of watercolor brushes, each best suited for a particular technique. Then there are sizes of brushes and to complicate it more, sizes aren't standard. A size 2 brush in one brand might be 3 times bigger than a size 2 brush in another brand. So there's that. I recommend having a set of very small brushes for details in small paintings or sketchbook art. I have the Anna Mason Series in size 000, 0, 1, 3, and 5. These brushes are wonderful for details and are the only brushes I use in my sketchbook studies. They are available here. I also love this set of very small brushes. This set here is a nice selection of 11 brushes that are all liners and riggers, great for feathers, fur and long lines. For larger paintings, my favorite brushes are the Black Gold Quill Brush 311 series. These brushes have blended synthetic hair (medium tensile strength), with two toned lacquered wood handle. There are other brushes you may add to your collection as your skills and interests grow but these brushes will be a solid set. I do about 80% of all my painting with my Black Gold Quill Brushes. If you choose to explore other options, just stay away from brushes that cost less than $10/each. They will frustrate you with their shedding hairs and poor quality. And they are FINALLY available online. A stretching board — preferably 1/2" thick white gator board, about two inches bigger in both height and width than the watercolor sheet you will paint on. For example, I love to paint on full size watercolor sheets (30 x 22) so I order my gator boards to be 32 x 24. I order mine from Tsuga Fine Art in Bothell. You could call beforehand and let them know what size you want so that they can have your boards already cut for you when you go pick them up. Here are some sample sizes and prices. Let Ken know you are ordering these for a class you are taking with me. An easel so you can draw and paint at an angle. This allows you to control washes beautifully. Although quite large, I love the SoHo Urban Artist Adjustable Drawing Board Adjustable Drawing Board. A smaller great choice, perfect for smaller paintings and sketchbook exercises is the Daler Rowney Artsphere Easel. A lightbox for tracing images. Some people feel that using a light box is "cheating" but botanical art demands precise, clean drawings with little erasing and minimal smudges. For that, I do recommend a light box and specifically I recommend the Tracing Light Box, AGPtek 17"(A4 Size) LED Artcraft Tracing Light Pad Light Box For Artists,Drawing, Sketching, Animation. It's affordable at a fantastic price of $36 and it is thin enough to be able to use between pages of a sketchbook. Buying supplies becomes an addiction so start with what you are comfortable getting and don't feel the pressure to buy all the favorites listed here. Happy shopping!